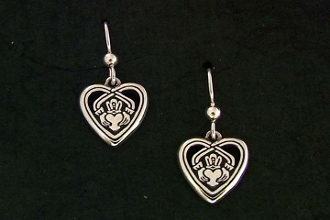 The "Claddagh in your Heart" design is an original expression of the Irish Claddagh symbol, (see Claddagh description below). The arms passing around the "hands, crown, and heart" create a heart shape and the added symbolism of keeping the "friendship, loyalty, and love of the Claddagh within our own hearts. This original design emphasizes the family and internal value of thi imagery within us.